When I'm not working for the PDF Association I still do some consulting in the document management space. Some recent conversations prompted me to revisit an assessment I wrote four years ago exploring a typical conversation between PDF technology providers and PDF technology users. As will be discussed at the upcoming Electronic Document Conference in Seattle this June, PDF technology is on every desktop and phone, even more places than before. Every bank, insurance company, government agency, and business of any scale relies on PDF for the documents they need to retain and share. But the executives in charge of these organizations rarely ask whether or not they are using PDF efficiently, or getting the most from their investment in the format. DUFF: Does your organization's document management / enterprise content management (ECM) system support PDF technology? EXECUTIVE: Did you think we still use fax machines or something? Of course our systems support PDF! I probably open PDF documents 10 or 20 times a day! Just about everything we keep, apart from email, is a PDF! This part of the conversation always goes the same way. These days, PDF is so fundamental that many people are offended by the suggestion that they might not use it, or are somehow using it "wrong". They are often thinking of the various attorneys, clerks and other unfortunates who periodically make the news for releasing confidential information inadvertently because they didn't know how to properly redact a PDF. DUFF: Do you ever add notes or annotations to PDF pages? EXECUTIVE: Of course. I do that a few times a day when exchanging contracts or reviewing designs. DUFF: So how does your document management application cope with that? EXECUTIVE #1: It doesn't. I copy the file out to my desktop, add my notes, then email the file (or whatever else I need to do with it). None of this is recorded in the ECM unless I check the file back in. EXECUTIVE #2: It doesn't. Our vendor told us to use the ECM system's note-taking ability rather than adding PDF annotations. They said this would allow the notes to be searchable. What are their document management systems doing about it? Executive #1's system forces her to ditch the system in order to get the job done. When either executive says that their application "supports PDF", what they mean is that it can retain and display PDF files, period. I'd say these applications are failing their users. Is that what "support" means? For both executives, their current-generation software has conditioned them to expect no more from PDF than they'd get from a fax. There's a lot of room to demand better, because not only is PDF feature-rich, it's an ISO standard, so there's no vendor lock-in. Even though PDF files comprise the most common single file type in millions of document management / ECM systems, my unscientific survey of current-generation enterprise-class applications found that useful support for PDF's features beyond mere rendering is not widespread, to the frustration of many users. Firms such as Dropbox promote their tight integration of PDF features, but even their offerings are limited, and they remain the exception. Given the format's ubiquity and longevity, there's a major opportunity for document management technology that fully leverages PDF as a toolbox for solving enterprise content challenges rather than as a model for page-rendering. There's a whole world of usage beyond rendering; users want to work with their documents, not merely read them! Interested in PDF, and its place in the world of electronic document technologies? 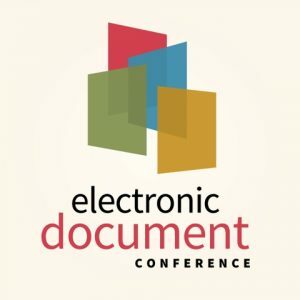 Join us at the Electronic Document Conference in Seattle, June 17-18! Get the questions and the answers to help guide your use of the world's chosen electronic document format.